Simon loves to explore the digital opportunities that may exist for our clients before developing an overarching strategic approach that defines what they need to communicate and the smartest way to deliver it. Simon sees a future enabled by technology, not the dystopian alternative. “Today our phones talk to us, we interact with bus shelters and make on-screen selections in the grocery isle. Content and context differentiate these interactions, but the ‘big data’ generated during these exchanges often defines us to a greater extent than the transactions themselves,” he adds. Majoring in Information Systems at Auckland University, it’s no surprise Simon embraced the powerful role of data in the new business environment. With an educational background in both Commerce and Computer Science — and commercial experience in delivering several SAAS (software-as-service) programmes and platforms — he’s quick to embrace emerging trends. 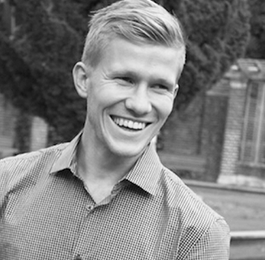 While still at university, Simon co-founded Brandfibre with Andrew Morris. He has gone on to lead and implement many of our digital programmes. Bottom: KTN Corporate Website. Mayfair, London. A revised corporate website, with a strong content management system implemented.